In 1993, we purchased the 4.5-acre remnant of the old Glenn Farm one mile east of Interstate 75 in the East Brainerd suburb of Chattanooga, Tennessee. The old farm house, barn, and acreage were a wonderful fun haven for our family, and our children still affectionately call home "The Farm." Fifteen years later, we added another acre after the last of the neighboring Walker Farm was sold by its heirs to a local developer. This area along Mackey Branch was historically known as Tsula Creek of the Opelika Settlement, which was inhabited by the Cherokee until the mandated removal in the 1830's. "Several notable Cherokee made their homes in the East Brainerd-Graysville area, among them one of the Fields brothers and Alexander McCoy, secretary of the National Committee. The farms were strung out mostly along Mackey Branch, which they called Tsula Creek. We have been told that the original structure was a two-room house built by a Cherokee, however, we have been unable to confirm that information. Local deed records indicate that our property was part of the J.T. Phillips Tract from the 1800's, who conveyed to Charles Dudley in 1909, then to the Boyds in 1924, who then sold to the Glenn Family in 1944. Pre-Civil War and Civil war artifacts were found in the cistern under our house by prior owners. While renovating our kitchen, we discovered the original stone hearth, and our son found an ancient rattlesnake skin while removing the old fireplace! We intend to continue learning more about the history of our property and the local area. Over the past 23 years, we have seen our area explode with commercial development, so we aim to preserve and nurture the 75 to 100-year old oak, pine, cherry, locust and black walnut trees that help create the peaceful atmosphere at St Francis Cottage. We have enjoyed cultivating new trees, shrubs, and perennials, along with 40 blueberry bushes, thornless blackberries, Gogi berries, strawberries, figs, pears, Muscadine grapes, asparagus, garlic, and the usual summer vegetable garden of tomatoes, squash, cucumbers, beans, peppers and herbs. In order to preserve the integrity of the original Cherokee-occupied lands, we use no chemical fertilizers, herbicides or pesticides in any of our gardens. Now empty-nesters, we desire to share our home and gardens with others on a more regular basis, beyond the visits from family and friends. After researching bed-and-breakfast operations for the past twelve years and working with local governmental authorities, in 2016 we decided to take the plunge, and construction of St. Francis Cottage began on 2.3 of our 5.5 acres. St. Francis Cottage has been created to provide a private, serene setting from which guests can venture out to enjoy the many splendors of the beautiful Scenic City and the surrounding area. Each guest will be treated with the kind of attention that is reserved for family. When our guests arrive, we want them to leave their troubles at the door and step into a world of comfort and rest in an urban cottage setting. Our aim is to enhance the elements of a well-lived life through genuine hospitality, restful rooms, nourishing and delicious food and engaging conversation among our visitors. As owners, we intend to see that attention to detail and service are dedicated to each and every person. We have found that people live more fully when connected to the wonders of nature, so we continue to develop our herb, vegetable and flower gardens throughout the property. At St. Francis Cottage, we embrace enthusiasm, creativity, nature and community. After growing up 1,300 miles away from each other (Nancy is from Port Clinton, Ohio and Wallace being raised in Central Texas), we met in a Christian community at the Church of the Redeemer (Episcopal) in Houston, Texas during the mid-70's. We married there in 1979, graduated from the University of Houston, and then moved to Atlanta, Georgia where Wallace worked as a producer for the Episcopal Radio-TV Foundation. Millard Fuller, founder of Habitat for Humanity International, was a guest on one of ERTVF's shows, and in 1982 he invited us to visit Habitat's international headquarters. This prompted another move to Americus, Georgia, where we worked with Habitat for Humanity International for five exciting years and met many amazing homeowners, volunteers, and staff. In 1987, we and our two small children, Hannah and Michael, moved to Chattanooga where Wallace has worked in the corporate video production industry for the past 30 years. Once our children were in elementary school, Nancy began her career as a commercial real estate paralegal and has worked both in Chattanooga and Atlanta. In 1993, we stumbled across an ad for an urban mini-farm and after climbing up into the hayloft during our first visit, we knew it was the place for us. Our children still affectionately refer to home as "The Farm" even though Hannah moved to Winnipeg, MB after graduating from the University of Richmond and marrying a wonderful Canadian (Phil), and after graduating from UC-Berkeley, Michael lives and works in California. During their visits from Canada, we love watching our granddaughters Grace and Amelia collect eggs, play with the animals, climb the treehouse, conquer the swing set, and pick berries, as our kids enjoyed doing while growing up. During our empty-nest phase these past 12 years, we have considered many different options domestically and overseas regarding our future and retirement. After much prayer, research, discussion and ongoing encouragement from family and friends, we kept coming back to the idea of constructing a bed-and-breakfast on our home place. We love meeting people and learning about their journeys along with cooking together for others, organic gardening, and pursuing artistic projects that have been put on the back burner for years. Although the planning process has been long and arduous, we are extremely excited about living our Golden Years as innkeepers of St Francis Cottage. The name for our B&B came to us pretty quickly and didn't change throughout the planning process. 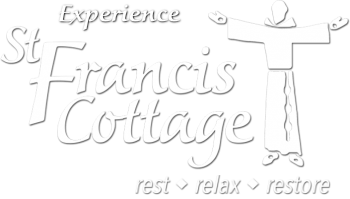 Nancy was taught by Franciscans at the Catholic School she attended as a child, and as the patron saint of animals, merchants, and ecology, we believe St Francis Cottage is the perfect name for our bed-and-breakfast. We are so impressed with Pope Francis for his humility, servanthood, and concern for the disenfranchised and impoverished. ALL are welcome at our table, and we look forward to meeting you soon! * All plastics with Types 1-6, and aluminum/glass/paper are recycled. * We do not use Styrofoam. * New dual-flush toilets requiring lower water consumption are utilized in order to save many gallons of water each day. * A highly energy-efficient HVAC system includes individual thermostats in each guest room. * Energy-efficient light bulbs are used throughout the Cottage. * Ceiling fans are installed throughout the Cottage to help regulate temperatures and comfort. * Cleaning solutions and laundry detergent are non-toxic and made on-site from natural ingredients, when possible. * Our washers and dryers are high-efficiency models, using less water and electricity and include steam sanitizing. * We encourage guests to re-use towels and have their sheets changed only as needed. * Many of our amenities are organic, and we use eco-friendly linens and towels for guest rooms. * We compost all food and garden waste and use them to enrich the soil in our gardens. * Whenever possible, we buy local and organic food. * We support local plant sales and incorporate historic and native plants into our landscaping. We use organic fertilizers and do not use chemical pesticides or herbicides in any of our gardens.